Numbers 7, 8 and 9 of Miller’s Avenue look like any other houses in any other well-kept neighbourhood. But behind these brightly coloured doors live people with very complicated lives. When Yvonne in number 7 joins an online dating website, she’s looking for something more than friendship but after a series of disastrous encounters, decides to shut down her account. Is she shutting out her only chance of finding love? 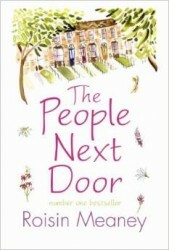 Next door in number 8, Dan signs up for a cookery course, determined to move on after his wife’s desertion. But as his lemon souffle rises, so does his interest in someone close to home. Will his fingers get burned second time around? Further along in number 9, Kathryn is struggling to keep her marriage together despite the best efforts of her interfering mother-in-law. As tension grows between the two women, Kathryn wonders if Grainne will finally succeed, as she realises that she may never give her husband Justin what he wants. As the drama unfolds along Millers Avenue, the inhabitants learn that the things you most yearn for can often be found on your own doorstep.